Michael Green Architecture (MGA) just unveiled a proposal for a carbon neutral wooden skyscraper in Paris that, if constructed, will be the world’s tallest wood building. Created in collaboration with DVVD and real estate developer REI France, the wooden skyscraper—dubbed the Baobab—was designed as part of the city’s Réinventer Paris, a competition seeking innovative and environmentally friendly urban projects. The designers estimate the 35-story wood high-rise could sequester 3,700 metric tons of carbon—an amount equivalent to keeping 2,207 cars off the road for a year. 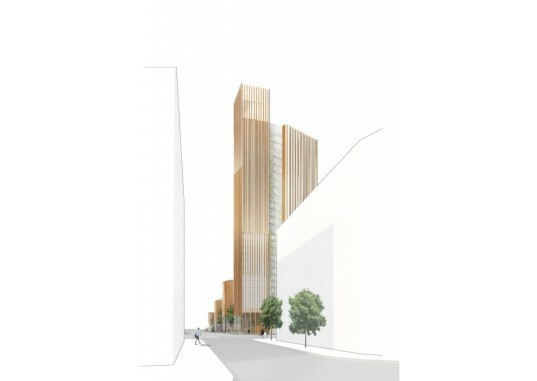 MGA is no stranger to tall wood architecture; the Vancouver-based architecture firm designed North America’s tallest wood building and has even published a study, The Case for Tall Wood Buildings, that explains the many sustainable benefits of timber buildings. This study and Principal Michael Green’s 2013 TED talk on the subject have helped spur the popularity of wooden buildings worldwide. 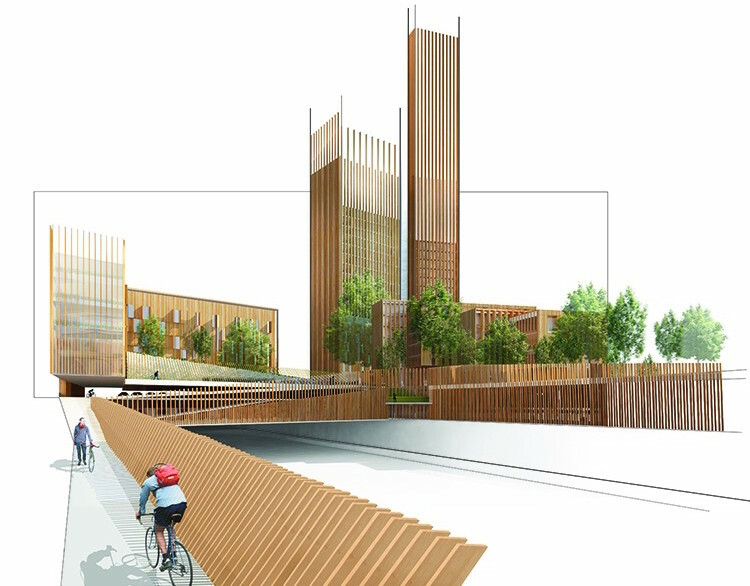 The proposed carbon-neutral Baobab is designed as a mixed-use development that combines mixed-income housing with a student hotel, urban agriculture, a bus station, e-car hub, and more. Conceptually located in Paris’ Pershing Site, the Baobab would span the eight-lane Peripherique. Michael Green Architecture (MGA) just unveiled a proposal for a carbon neutral wooden skyscraper in Paris that, if constructed, will be the world’s tallest wood building. The designers estimate that the 35-story wood high-rise could sequester 3,700 metric tons of carbon—an amount equivalent to keeping 2,207 cars off the road for a year.